SEVERAL readers have independently informed us that the man who appeared in Battistelli's bizarre piece from 2 years ago (never mind the infamous diversity spin) wasn’t just some arbitrary person; we didn’t mention at the time and we have since then received a more recent/fresher copy (above), but Benalla is no stranger to Battistelli and the EPO. I personally cannot read French, but some readers who can have sent us valuable input. Immunity? For violent thugs, too? 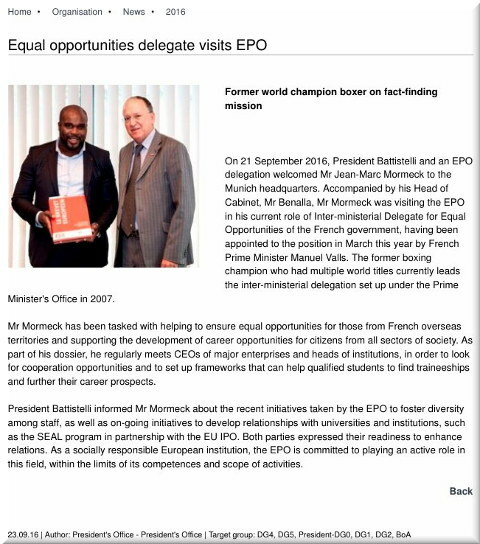 Many people talk about it at this very moment and it’s an opportunity for French media to pay closer attention, follow some leads, and learn about Battistelli’s corruption and sheer injustice at the EPO.